I'm not sure what I'm going to start today. I need to assess my mood, check out my stacks, and make a decision later on. 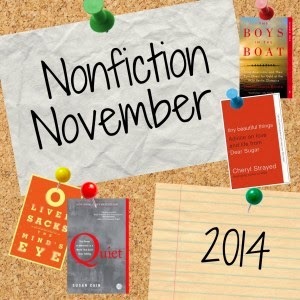 The read-along books for Nonfiction November have been announced. I'll definitely be reading one of these. Check out this Bookish Q&A from Katie at Words for Worms. I might have to steal these questions for my own blog very soon. I've started re-watching Star Trek: The Next Generation. It's as amazing as I remember. It's the first show I was obsessed with. It's the show that inspired my first tattoo. It's the show that roused my great love for Patrick Stewart. I'm ridiculously happy to be watching it again. What's up with YOU? What are you reading? Cooking? Watching? Let me know in the comments. Me? I'm up to 5-foot-7 -- still. ;) Reading: today, James Lee Burke's A Morning for Flamingos. Cooking? Huh, what's that? ;) Watching: Parks and Recreation, Raising Hope, Criminal Minds <-- which one of these is not like the other, hmmmm? Bryan, Bryan, Bryan. ;) No cooking? Just ordering wings, right? Ha! You crack me up! After loving the new movies, I watched the entire original Star Trek series (plus the first six movies) and got four seasons into TNG before I just got totally burned out. I definitely want to get back into it. And watch the rest of the movies. And watch the other three series. Maybe after I'm done binge-watching Frasier I'll get back into it. I think you're right. The older you get, the faster time flies by. That's crazy! Can it go a little more slowly?! My dad loved Star Trek: The Next Generation and I remember watching it with him. What does your tattoo look like? Does this mean you're going to watch the Star Trek movie too? Bryan cracks me up! I'm in between books right now, but I'll probably start A Brief History of Seven Killings by Marlon James. Watching: Once Upon a Time (I'm not really a TV person). Happy Sunday!! It's too crazy fast lately. I was talking to my dad about it last night and he dropped the "wait until you're MY age" gem on me, ha! My tattoo is a Klingon symbol. I got it right when I turned 18 so it's pretty faded :( I need to get it freshened up. I'll probably re-watch every Trek show and movie I can get my hands on. I should wrap it all up in 2025 or so, lol. There's a LOT. I hope my comment took. It disappeared! I keep seeing The Underground Girls of Kabul popping up and it sounds pretty fantastic. Looks like I might have to check it out. I'm doing quite a bit of Netflixing lately, too....I'm watching Gilmore Girls (alone) and the husband and I flew through Peaky Blinders. I know you'd really like it, Shannon. It's up your alley, I promise! I'm watching GG as well. I'm taking a break to nerd out over Star Trek for a bit though ;) Oh yes, I'm always alone when I binge. My hubby has zero interest, lol. I'm going to try that slow cooker corn and potato chowder... looks delicious! I started The Paying Guests by Sarah Waters yesterday and am really enjoying it so far. It's darn tasty, no lie! I'd like to read more Waters. I haven't read nearly enough of her. Oh, Jean Luc indeed. My word :D I was trying to figure out how old I was when I fell for that guy. I *think* I was 16 or 17? Yeah, I'm old. Stop doing the math, lol. Cripes! Isn't that a great one? It sounds very Midwestern to me. So much for that corn chowder idea, lol. I'll try to post something that he'll enjoy next time around, ha ha! I started Gilmore Girls too, it's bookish and sweet. I'll get back to it, one of these days. The chowder looks fantastic. I have to admit I'm not much of a Trekkie but I married one so I have probably seen all of TNG. I don't own either of the Nonfiction November books but I might do my own nonfiction reading spate, just because. I would LOVE if my husband had even a little bit of Trekkie in him. Alas, he doesn't. He's more of a Star Wars guy. Lame, lol. Ohhh how I love ST:TNG. Even the campy first season episodes! I was SO young when I fell for this show. I knew it was a long time ago but when I really did the math I was almost stunned, lol. I love that you have a Star Trek tattoo :) I started watching Voyager a while back, but I need to dive back in. I'd really love to watch ALL the Star Treks some day, but dude... it's a lot. And I'm a lazy watcher-of-things. It was my first, sigh...memories ;) There's nothing like TNG but I'd really like to watch the first series too. I haven't seen those in forever and ever. That chowder looks delicious! I'm with you; this autumn has flown by. I know that November is technically part of fall but it so often starts to be cold and the leaves are all gone. Your first tattoo? How many do you have? I've been trying to work up the courage? November always sounds wintry to me, but that might be because I'm in Wisconsin, lol. I like this kind of post! A little bit of everything. When something inspires a tattoo, you know it's a big deal! Lol! Thanks! I do one of these wrap-ups every week :D It's mostly so I can keep track of my life, lol. I love Star Trek: The Next Generation! You have great taste, ha! ;) Great minds think alike and all that. I have seen so much about The Underground Girls of Kabul, I had to go ahead and request a copy from the library! It does sound good. So does your chowder! It's incredibly interesting. It makes me you think, that's for sure. The chowder is super yummy. I'll definitely be making it again. I loved Katie's bookish Q&A also! Will look forward to reading your answers. And - yes...Sedaris is hilarious! I loved his story about the NYC tourists...as an ex-NYCer, I totally appreciated his commentary! I have read Quiet a few days ago and I loved it. Hope you enjoy it as well.